The United States Congress designated the Bruneau-Jarbidge Rivers Wilderness (map) in 2009 and it now has a total of 89,820 acres. All of this wilderness is located in Idaho and is managed by the Bureau of Land Management. The Jarbidge-Bruneau Rivers Wilderness has some of the best class V whitewater that Idaho has to offer. The Jarbidge River offers a remote and challenging 29-mile float trip taking boaters through a maze of spectacular canyons, "hoo-doo" rock spires, junipers and red volcanic cliffs. The Bruneau River flows north from headwaters in the northern Nevada mountains and is known for its sheer-walled, rocky canyons and whitewater boating opportunities. 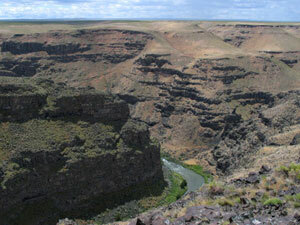 The 50-mile long Bruneau River begins at the confluence of the Jarbidge River and the West Fork Bruneau River. In the Wilderness, which ranges from 2,600 to 5,100 feet in elevation, plateaus are divided by deep, winding river canyons. These canyons and plateaus provide habitats for sensitive species including bighorn sheep, redband trout, bobcat, and river otter. Sagebrush dominates the area which only receives about 7.62 inches of precipitation each year. Average temperatures are 72 degrees F in summer, 52 in spring and fall, and 40 in winter. However, average high temperatures in July and August are around 95 degrees. Planning to Visit the Bruneau-Jarbidge Rivers Wilderness? How to follow the seven standard Leave No Trace principles differs in different parts of the country (desert vs. Rocky Mountains). Click on any of the principles listed below to learn more about how they apply in the Bruneau-Jarbidge Rivers Wilderness.